***This is a powder spray, not a liquid spray. The main ingredient is watermelon frost – the white frost compounded from watermelon rind and mirabilite. It has a unique a tonic effect on the upper respiratory tract. Clinical experiments suggest watermelon frost may be of benefit to a variety of oral conditions. Watermelon Frost is prepared according to a secret recipe which has been passed down from generation to generation. The main ingredient is watermelon frost – the white frost compounded from watermelon rind and mirabilite. It has a unique a tonic effect on the upper respiratory tract. Clinical experiments suggest watermelon frost may be of benefit to a variety of oral conditions. 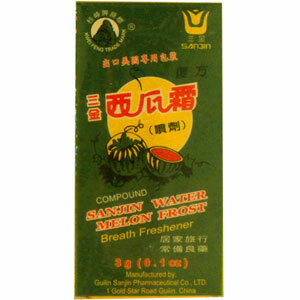 Relieve swelling and pain, moisten throat. Hoarseness of the throat, throat moth, sore or swollen throat, gingivitis, ulcer of mouth and tongue. Acute and chronic pharyngitis, tonsillitis, inflammation of the oral cavity, painful and swollen gums. Spray product on the affected area 3 to 6 times a day, 2 to 4 sprays each time. For more serious symptoms, the patient may take the product orally.